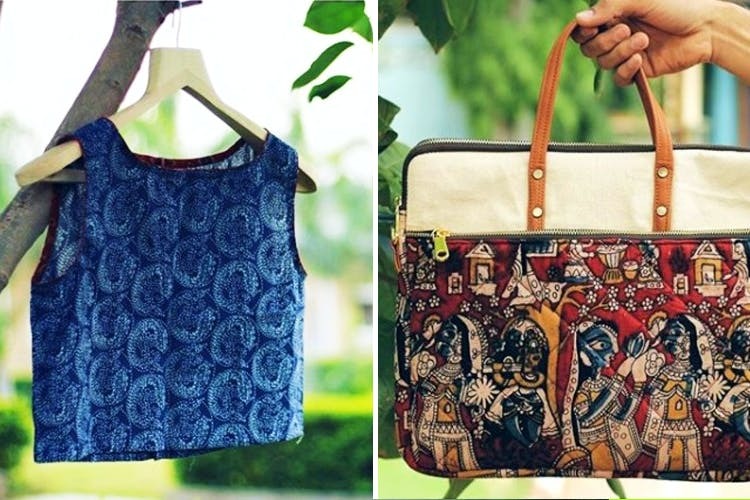 Printed cotton crop tops, tie dye denim sling bags, kalamkari laptop sleeves & more! Get all these pretty little things from Satrang, a homegrown fashion brand by an impressively talented duo – Rita Mehta, a textile designer and 21-year-old Nikhil Pandey, third year student at MIT Institute of Design in Loni Kalbhor. Started in the year 2016, Satrang aims at bringing back the long-lost trend of hand dyed fabrics. For a brand so young and unique, the collection, on the other hand, reflects impeccable maturity and finesse. What we loved the most is the tie-dye handmade maxi dresses, starting at INR 700 and the self-woven short and long kurtas for INR 600. The project is not just about reviving a trend, it’s also a small yet definite initiative towards the Make In India campaign. While Rita takes care of the manufacturing part of the business, Nikhil curates and designs tie dye patterns for every product, based out of his hostel room. However, the duo’s true forte lie in their intricately designed leather bags and laptop sleeves on kalamkari and dabu fabric. Starting at INR 1,200, the tan brown box sling bag with block-printed flap and the customised laptop sleeve with two compartments, made out of a combination of canvas, kalamkari and leather. Fashionistas, wondering what to pair your slim fit trousers with? Why don’t you check out Satrang’s line of cotton tie-dyed shirts in cool blue, indigo, emerald and soothing yellow, starting at INR 600. They are light, fun, extremely trendy and will give a twist to your mundane formals. Nikhil and Rita make sure you get nothing but the best out of Satrang. Every item for sale is customised according to your needs, demands and budget. When you place an order, you get to decide the fabric. If you go for hand dyed material, your order will be couriered at your doorstep within 24-48 hours. If you want handloom fabric with detailing and stitch work on your product, the process can take a little longer. However, the finished item would be delivered to you within seven to 10 days. When it comes to pricing, every product is reasonably affordable and the experience is definitely worth it. So why wait? Order your favorite Satrang handbag or a mid-length cotton dress now! Call up Nikhil at +918080263484. And don’t forget to follow their Facebook and Instagram pages for update on latest collection. Every product on Satrang has delicate distinctive designs. Besides, as we mentioned Nikhil and Rita are always up and ready to customise an item exclusively for you. Order your very own Satrang wallet or a kurta and let us know what you think!